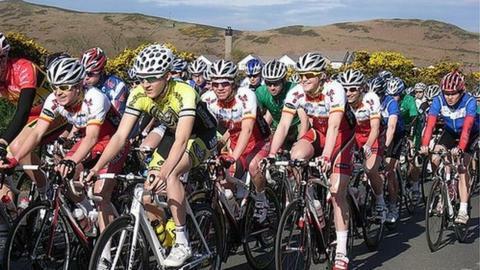 A record 357 cyclists from across the British Isles will contest the Isle of Man Youth Cycling Tour next month, organisers have confirmed. It is hoped the annual event's popularity will provide a boost to the island's bid the host British Cycling National Road Championships in 2016. IoM Cycling chairman Richard Fletcher said it is a great chance to speak to British cycling officials. Fletcher said it is an opportunity to "showcase the island's facilities". "It is fortuitous timing in that the event is held under British cycling regulations and they send officials over from the North West and from their headquarters. "It is an opportunity to meet with those people and talk about the prospective bid and get their insight. "A lot of them are very aware of the Isle of Man as they have been coming for years," he added. This year cyclists between between the ages of five and 18 have signed up to take part in the three-day event, which starts on 3 May. It will begin with a prologue time trial on Douglas promenade. Isle of Man Cycling secretary Emma Gell said: "It is another record year with 30 more taking part than last year. "It starts with the time trial and then moves on to the roads. It caters for all ages and abilities, from novices through to British champions." Road races are scheduled for the Saturday and Sunday on closed roads. Over the years the Isle of Man Youth Tour has produced Olympic, World, European and British champions including Mark Cavendish and Peter Kennaugh. British road race champion Cavendish has already backed the Isle of Man's bid to host the 2016 British Cycling National Road Championships. It is expected the Manx course would include some or all of the TT course. Cavendish won the 2013 event in front of 30,000 spectators in Glasgow, while fellow Manx cyclist Peter Kennaugh finished fourth.